Hot Pod Floating Spa | OhGizmo! By Andrew Liszewski on 01/27/07 • Leave a comment! Where I’m writing this the temperature is currently sitting about -4 degrees F so what better time to start thinking (or dreaming) about the summer than now. If you’ve already got a backyard pool but at times would prefer the warmth of a hot tub then the Hot Pod is the way to go. It’s basically a floating hot tub made of flexible but sturdy “heavy duty” nylon that connects to your pool’s already existing heater system. Just use the included hoses and adapters to connect the Hot Pod to your pool’s inlet and return and then turn on the heater. 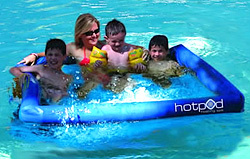 The hot water will then be pumped through the Hot Pod’s six “hydro-engineered” jets making the inside all warm and bubbly while the rest of the pool stays cool and refreshing. Well actually since the Hot Pod is using up all the hot water the rest of the pool will probably get quite cold if you leave it running too long so “refreshing” may not be the best description. The Hot Pod is currently available for $799.99 and while it’s definitely not cheap it’s still far less expensive than an actual installed hot tub.